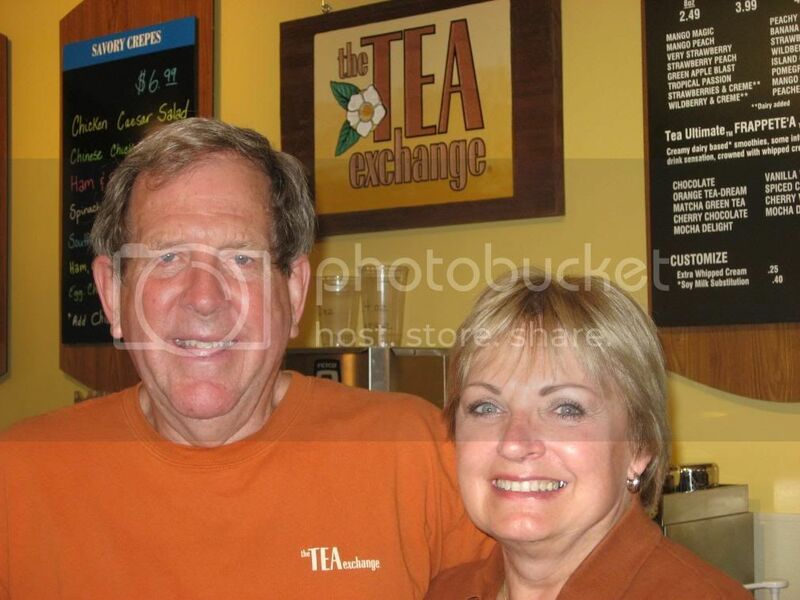 Above: Harvey & Ginny Durand of the Tea Exchange. This week I ventured over to visit the other side of the mountain. 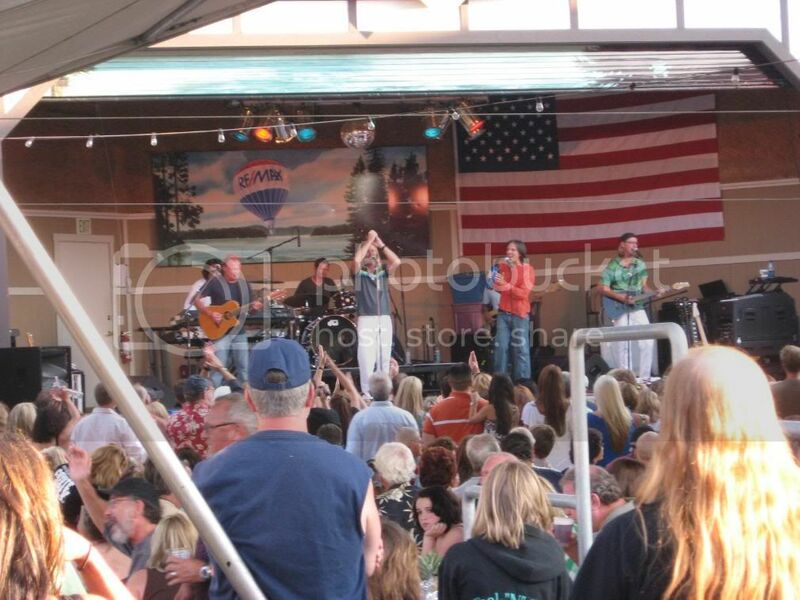 Lake Arrowhead sponsors a summer concert series that begins in march and includes a variety of music types. HM and I bopped over and decided to stay for a while. Above: We Listened to Venice live in Lake Arrowhead. 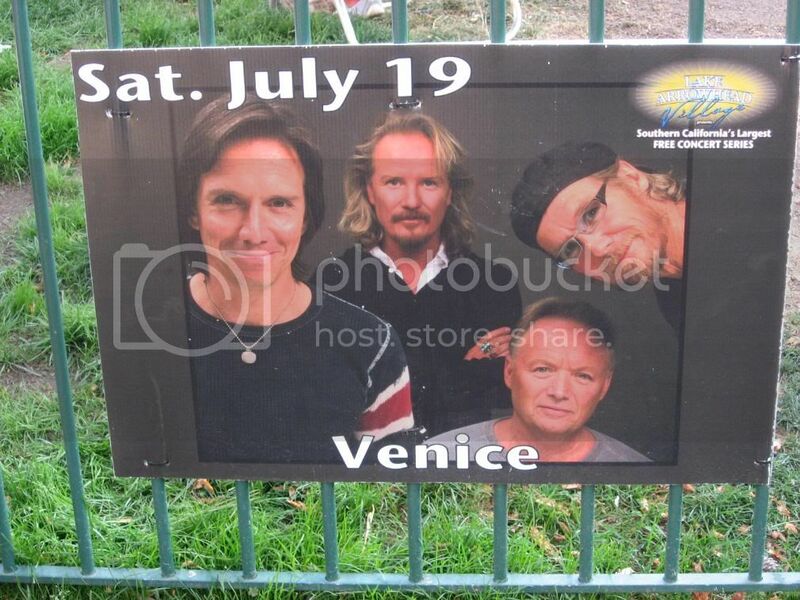 The official Venice website. I recognized the band from sometime in my past. The crowd was going wild–dancing, weaving, bopping, and just enjoying the nice weather and comfortable evening. Above: Some of the crowd at the Lake Arrowhead Summer Concert Series. HM was shopping (I am one of the few women on earth that hates shopping!) so I took the time to meander around to see what was new as I haven’t been over to Lake Arrowhead Village for a while. 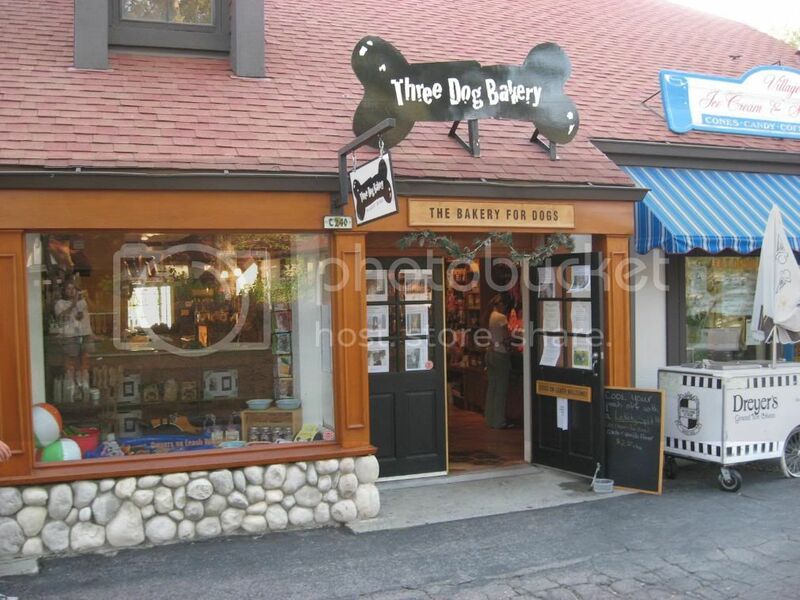 Above: Three Dog Bakery in Lake Arrowhead Village. Unlike the recently defunct Barkery here in Big Bear, the Three Dog Bakery is doing well. It was a bit crazy inside so I didn’t stick around to take interior snaps but it is a very nice environment and the dogs were sniffing excitedly. There are treats and lots of gift items for your precious pooch. 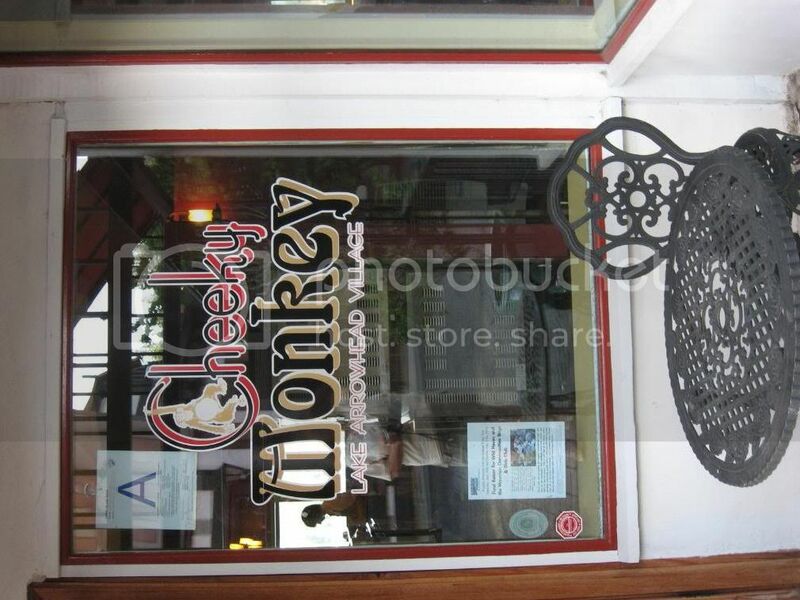 Above: The Cheeky Monkey took over the old Del Lago’s building. A new business is where the old Del Lago’s Coffee House & Bookstore (and later deli and boutique) was. In fact, they were celebrating the grand opening when we dropped by. Anyway, the old Lake Arrowhead location has the best lake view windows in the village. Drop by for a cup of java and some food if you have a minute. 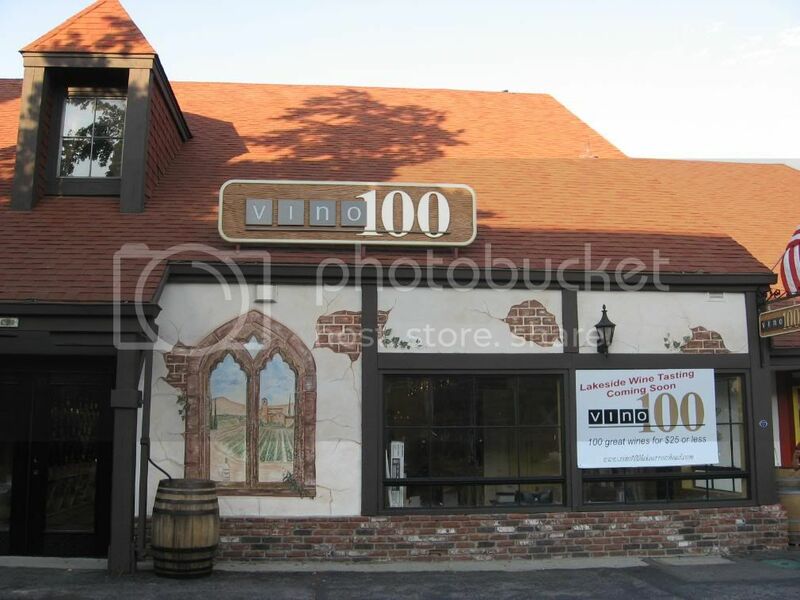 Above: Vino 100 is scheduled to open in the Lake Arrowhead Village shortly. Some of you might remember the winery that used to be in the Big Bear Village. They used to host tastings and had a great selection of all sorts of wines. I used to get private labeled champagne for some of my best customers. Too bad we only have the breweries now (neither of which brew on location). Anyway, the Vino 100 chain is known for having selections of wine for $25 and under. 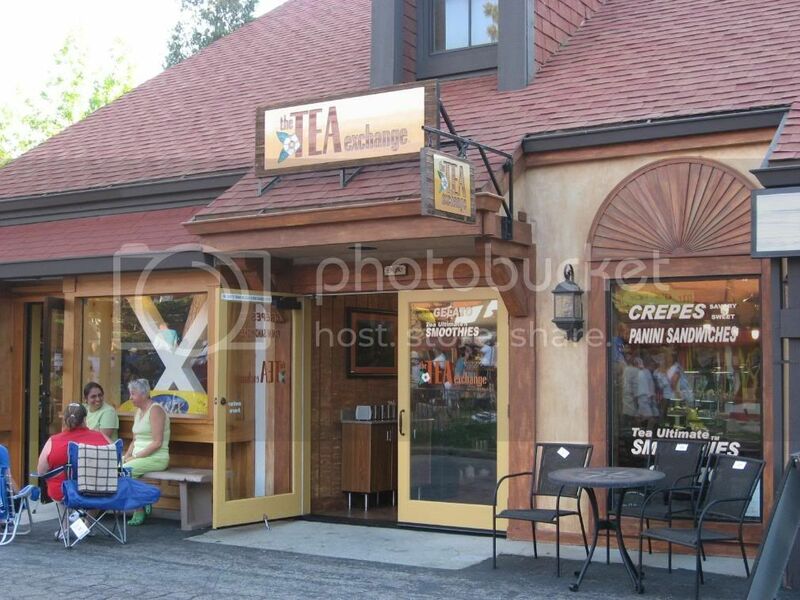 The scuttlebutt is that they will be open in Lake Arrowhead by the end of the summer. Above: The Tea Exchange is NOT a franchise. The Tea Exchange is the brainstorm of Harvey & Ginny Durand. The two have owned a home in the area for a long time but moved up from the South Bay (where I grew up) to make their dream come true. 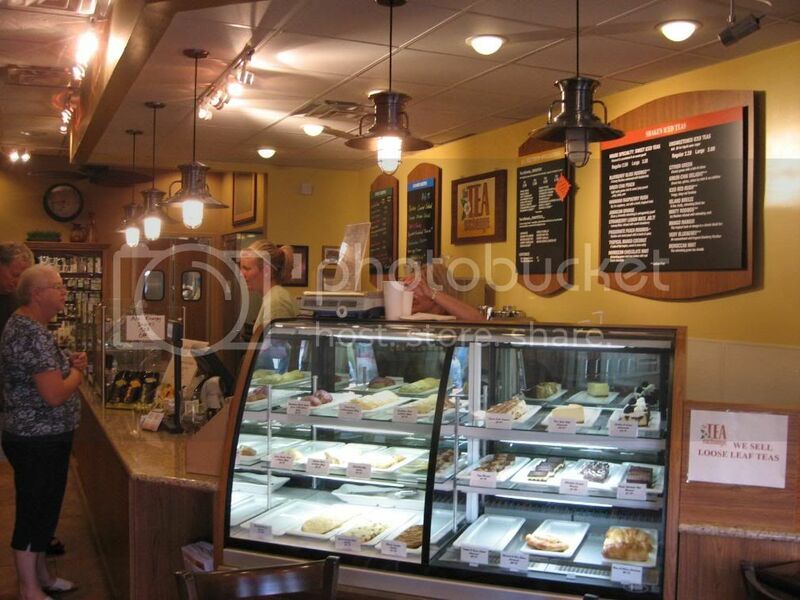 Above: The bakery case–all made on the premises except the cheese cake. Tea rooms were gaining popularity for a while but this place has the coffee house flair–great baked goods (decadent really), crepes, gelato, and a large selection of teas will satisfy most palates. 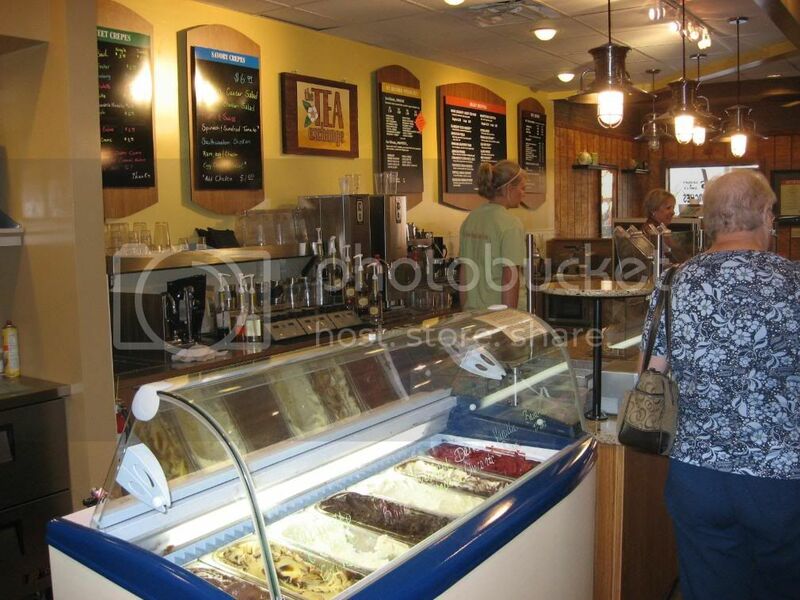 Above: Gelato selection is toward the back of the Tea Exchange. There is also a retail section with prepackaged teas (you can also buy in bulk), tea pots, tea cups, tea infusers, and a lot more! Above: Some of the teas available from the Tea Exchange. Order Tea Exchange Teas Online. I had a GREAT cup of Ginger/Tangerine herb tea (it was out of this world) and brought home the proprietary mix called, Fairy Tale Blend. 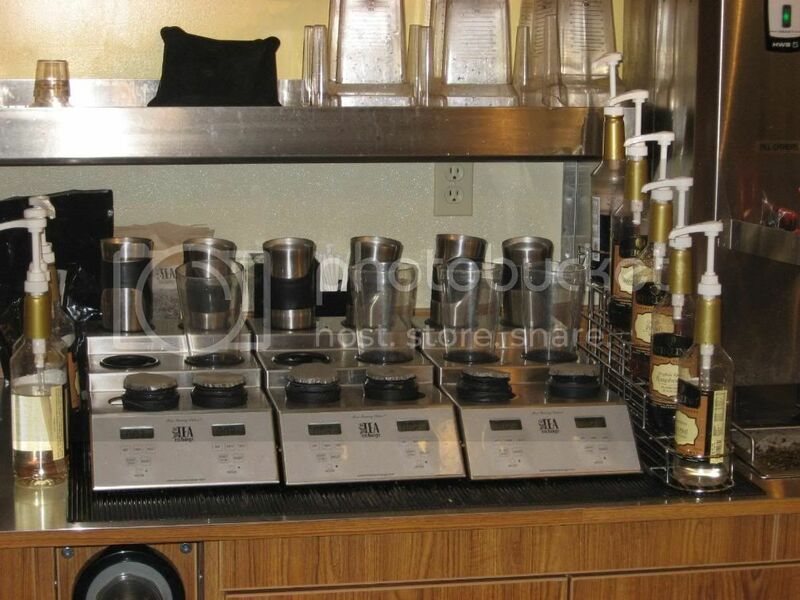 Above: The patent pending technology that makes the Tea Exchange teas so great. HM had a blueberry tea drink but could have selected a latte or smoothie–all made with fresh ingredients. Around us people were munching down on tasty treats and the place was packed most of the time except when I was taking pictures. Ginny told me that all the locals bossed them around (sound familiar?) until they got everything to their liking and perfected the menu and drinks. 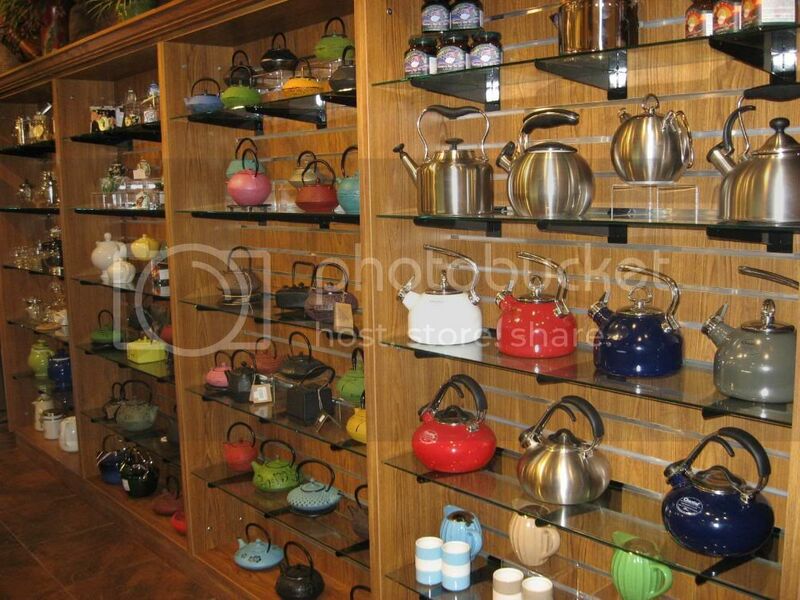 Above: Some of the tea pots for sale at the Tea Exchange. 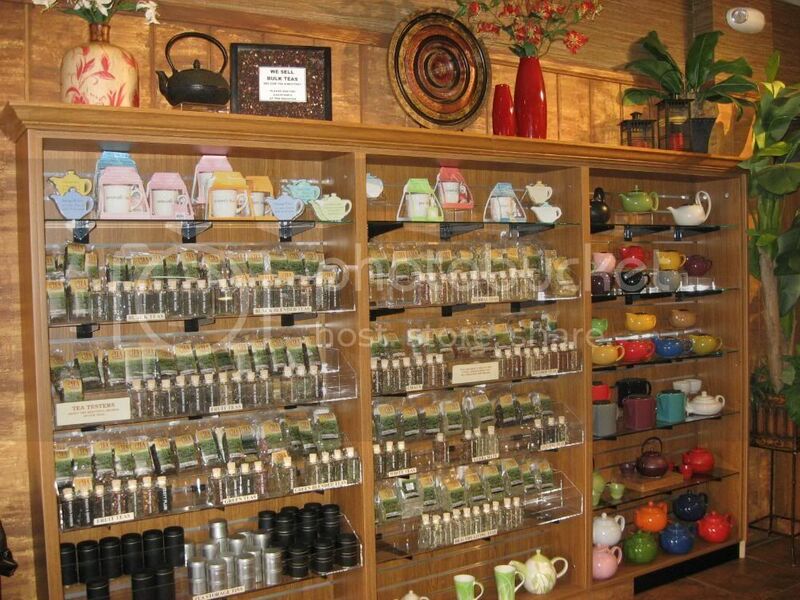 The Tea Exchange has been open for over a year and is pondering offering franchise opportunities. Both Harvey and Ginny were proud of their employees and said that they have had the same staff the entire time they have been operating. Above: Harvey prepares one of the famous crepes at the Tea Exchange. So, the next time you want to have a change of scenery but don’t want to travel too far–stop by and explore the new options in Lake Arrowhead. Be sure to go to the Tea Exchange and tell them GG from the Fawnskin Flyer sent you! Thank you for reading this post. 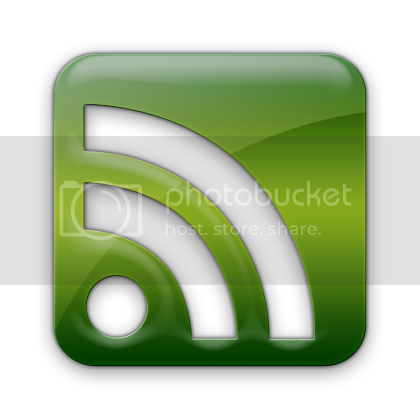 You can now Read Comments (9) or Leave A Trackback. This entry was posted on Wednesday, July 23rd, 2008 and is filed under Business & Commerce, GG's Day Trips, Mountain Lake Resort. Not at the moment. You can call them and I am sure they will ship but the website is still under construction. Thank you so much. Rita Carson and George Gorss are our friends and this is how we found your site. Thanks for stopping by. Glad you found the Fawnskin Flyer and hope you will keep coming back! HM and I were just talking about heading over there for a nice relaxing drink and nibble! Hi Ginny! I actually put a link to the shop in the post along with links to the website. Thanks for stopping by we want to come down for some yummy drinks and food soon!